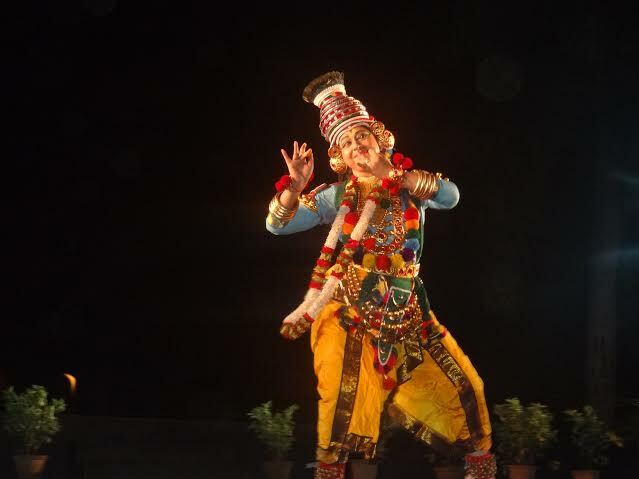 New Delhi, Oct 8, 2015: The majestic ruins of Delhi’s Purana Qila came alive today with the enchanting dance form of Mohiniyattam, as the five-day Old Fort Dance Festival opened to a resounding response. Bharati Shivaji & Group opened the festival with a performance of Kerala’s beautifully graceful Mohiniyattam, one of the eight classical dance forms of India recognized by the Sangeet Natak Academy. Performer-choreographer, Bharati Shivaji is a Padmashri award winner whose name is today synonymous with the exquisite Mohiniyattam. Presented by the Sahitya Kala Parishad & Department of Art, Culture & Languages, Government of Delhi, the Old Fort Dance Festival will showcase over five days some of India’s most treasured classical dance forms. Hon’ble Chief Minister of Delhi, Shri Arvind Kejriwal inaugurated the festival this evening; Hon’ble Deputy Chief Minister of Delhi, Shri Manish Sisodia was the Chief Guest; and Hon’ble Minister of Water, Tourism, Art, Culture & Languages, Shri Kapil Mishra the Guest of Honor. The festival of choreographies in classical dance forms will see participation of veteran and legendary dance artists and their groups in multiple dance forms including Pandit Birju Maharaj, Madhvi Mudgal and Leela Samson, among others. “The repertoire of Indian classical dances represents centuries of culture and tradition that has been preserved and sustained by generations of devoted exponents and earnest artists. Across the globe, Indian classical dance forms are appreciated and loved by dance lovers. We believe the festival will help extend the reach of classical dance forms to not just connoisseurs of dance but also to common people,” says Pandit Birju Maharaj. “The idea behind the Old Delhi Dance Festival to juxtapose cultural heritage with structural heritage is a wonderful concept. The Purana Qila presents a poignant background to the performance of India’s most notable classical dance forms, some of whom originated centuries back in ancient and medieval times,” says Ms Leela Samson. Eminent Bharatnatyam exponent, Leela Samson and her group will perform on the second day of the festival, bringing the expressions and sculpturesque poses of Bharatnatyam to an audience of Delhi’s dance lovers. Kuchipudi, the classical dance form from Andhra Pradesh, will be the dance of the day on the third day of the Purana Qila Dance Festival. The eminent dancing couple of Raja and Radha Reddy and their group will bring alive the much-loved art form from south India. The oldest surviving dance form of India, Odissi will be at centre stage on the penultimate day of the festival, with Padma Shri Madhvi Mudgal choreographing the performance of the soft and graceful dance form. The festival will end with a performance of Kathak choreographed by none other than Pandit Birju Maharaj and his Group. The legendary exponent of Kathak has received numeours accolades over the years including Padma Vibhushan, sangeet Natak Academi Award and the prestigious Kalidas Samman. So, if you are a lover of unadulterated classical dance traditions, mark your evenings this week for a memorable rendezvous.